Vantage sensors, when combined with an InFusion control system, allow homeowners to enjoy the full benefits of an automation experience. The Vantage Mini Motion Sensor 360-16 enhances a Vantage System by using motion to trigger tasks. Tasks that used to require toggling a light switch or pressing a button can now be triggered simply by entering a room or through changes in ambient daylight. 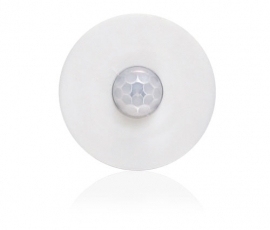 Inconspicuously mounted in either the ceiling or wall, the Mini Motion Sensor's 360-degree compact dome lens detects human body motion, instantly activating lights, security cameras, and other devices connected to the Vantage system.